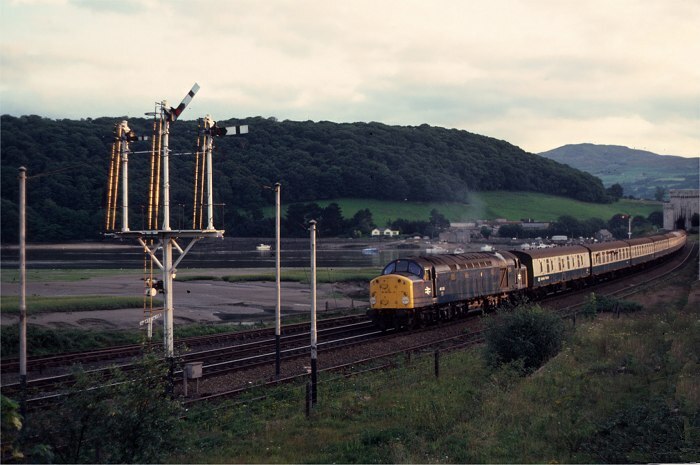 25 years ago this month, Sunday 24th August 1980, and 40120 works 1J31, the 19:35 Bangor to Manchester Victoria, consisting of 8 coaches containing a number of bank holiday weekend 'bashers'. This working was due at Llandudno Juncrion at 19:58 in the public timetable, but was actually scheduled 5 minutes later from 15 June to 31 August to allow stops at Llanfairfechan and Penmaenmawr to be made. But then, it also had 5 minutes recovery time between Penmaenmawr and Llandudno Junction, so timekeeping was probably 'flexible'! The train is seen approaching Llandudno Junction from the Conwy Tubular bridge and is routed along the Up Main through Platform 2 (now 3). The three routes available from this signal were from right to left as we look, to Up Passenger Loop (further routes available to bay and Up Goods Loop at the next signal), to Up Main, and a small shunt arm to the yard, carriage shed and holding sidings. This signal was shortly to be replaced by 3-aspect colour light signal with 'feather', still present today. In the foreground is the Up refuge siding, often used in the 1970s to stable coaching stock, and to the right of the bush a small wall - part of a loading dock for the original Llandudno Junction station, taken out of use in 1897.